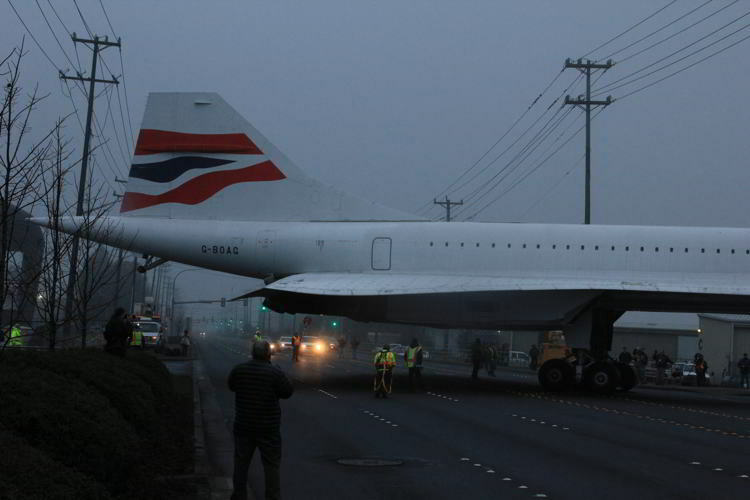 Across East Marginal Way from the Museum of Flight is a large lot known as the Air Park. 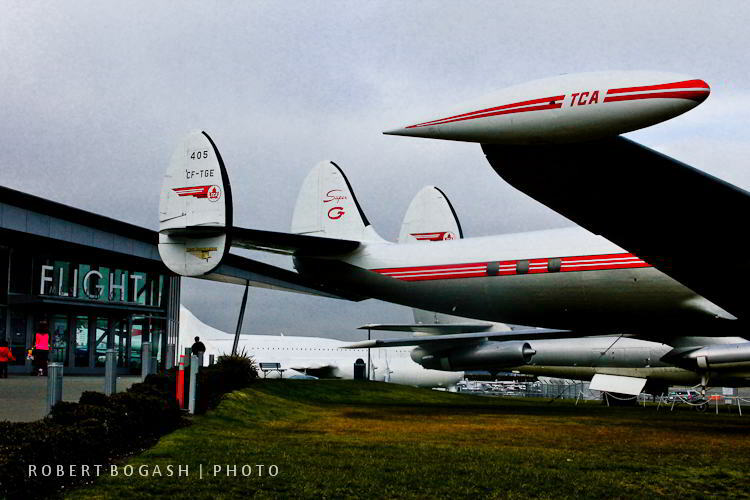 Residing there are six of the Museum's large airplane transport collection. 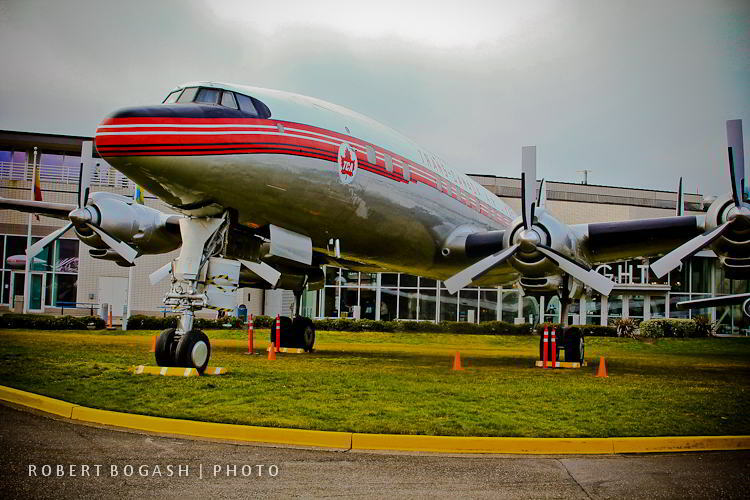 The MOF is blessed by one of the world's finest Transport airplane collections. I was involved heavily in many of their acquisitions. 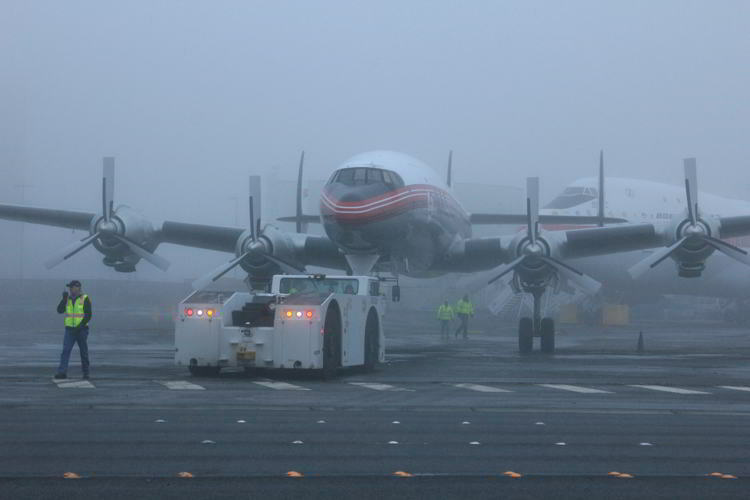 We also have a lot of other large airplanes - like the B-29. 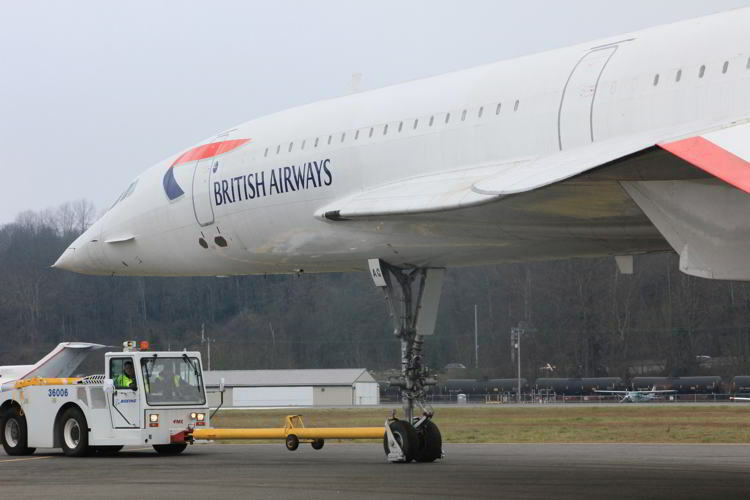 Big airplanes take up a lot of space, and unfortunately, up until now, that has been mostly outside. 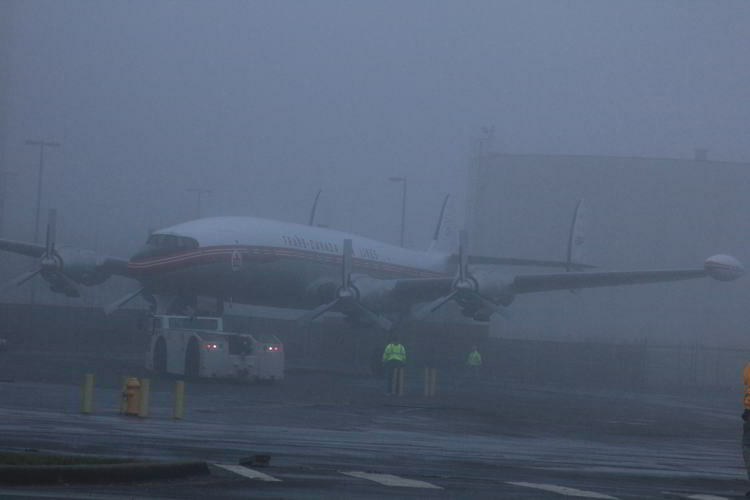 Seattle is not known for great weather, especially in the winter (Duh! 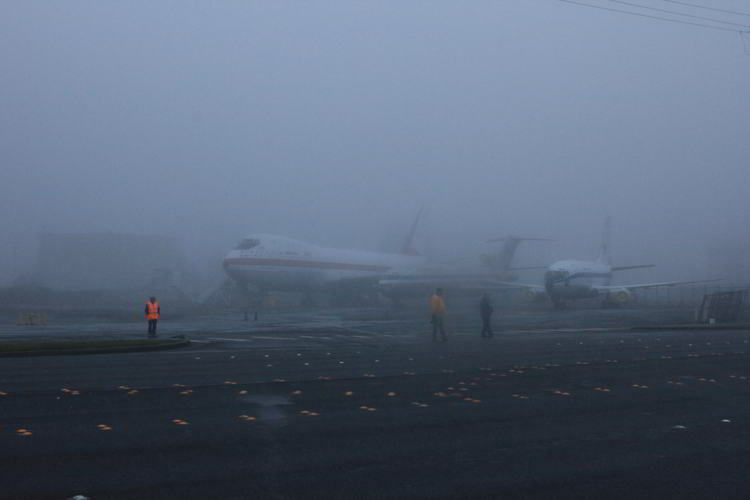 ), and our damp climate is literally death to an airplane. Death by a thousand cuts, or is it drips? 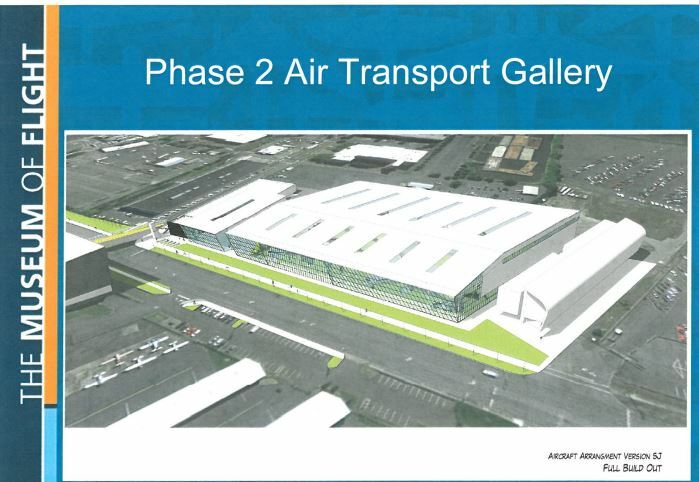 To solve this problem, the MOF has been working for some years on designing and funding a building which would place this collection under cover. 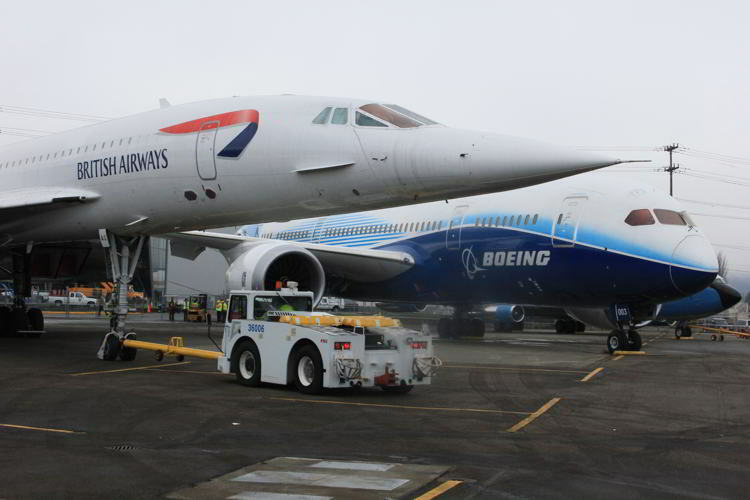 Big airplanes require a big building and big buildings require big bucks to design and build. Fortunately, the planning and fund raising is reaching a milestone as ground breaking for the new building is due in the next month. 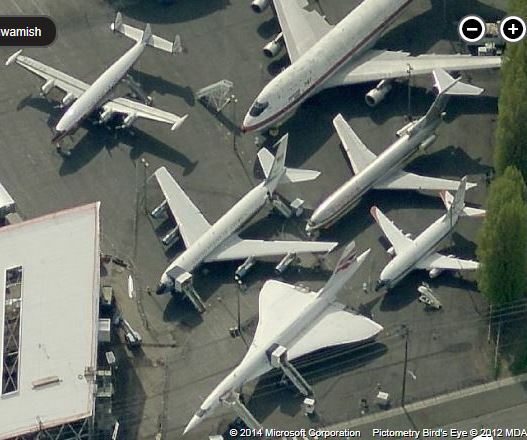 So - how do you build a big building where you already have a bunch of airplanes? Well, you need to move them out of the way. 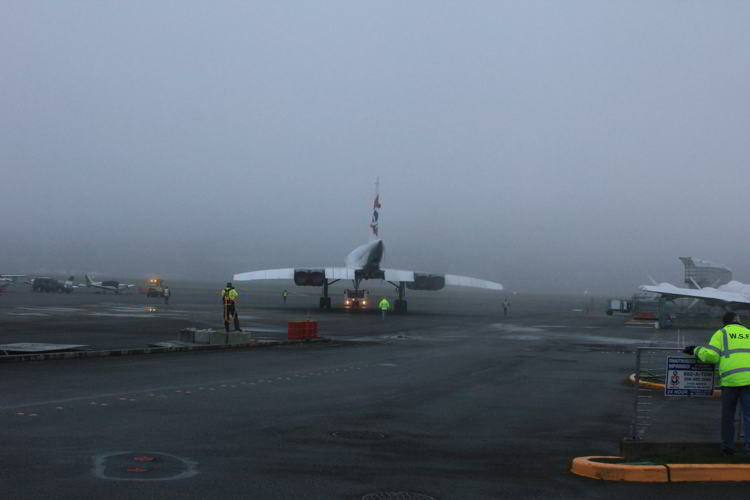 In the first of a series of moves, the MOF moved three out early on the morning of Saturday, 31 January 2015. This is a photo story of that move. It started early in the morning. It was dark. 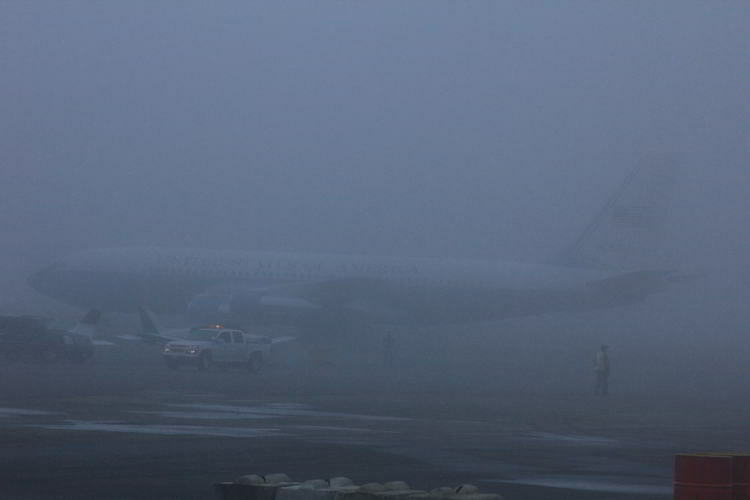 And it was raw - 41 degrees F. And it was damp, with a thick pea-soup fog that enveloped everything and everybody. 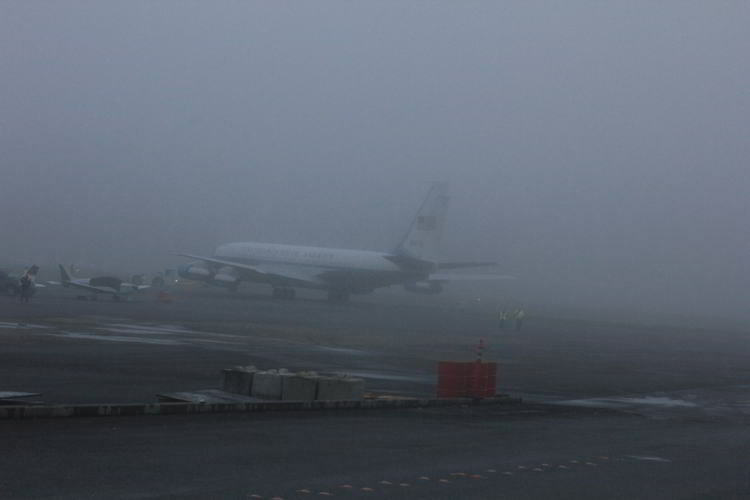 It was Seattle at its best /worst. 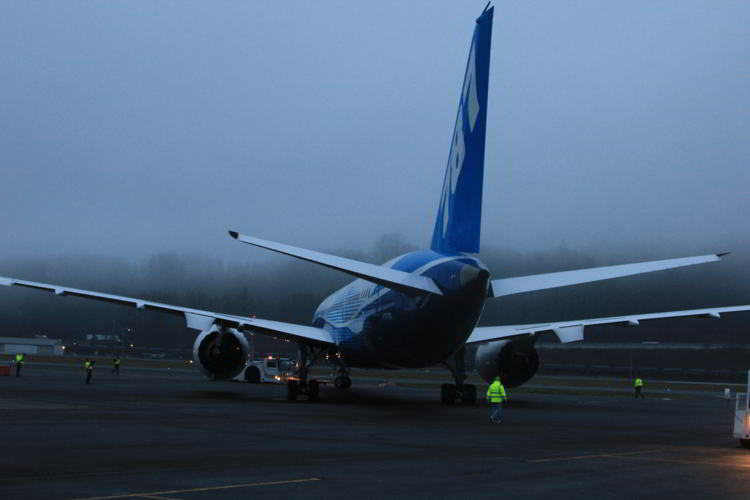 It was the reason these airplanes needed to go inside. 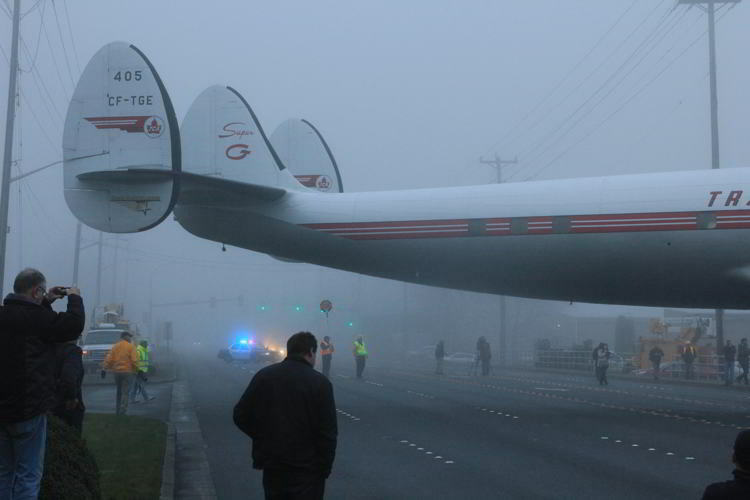 There were four airplanes that had to be moved on this Move Day. 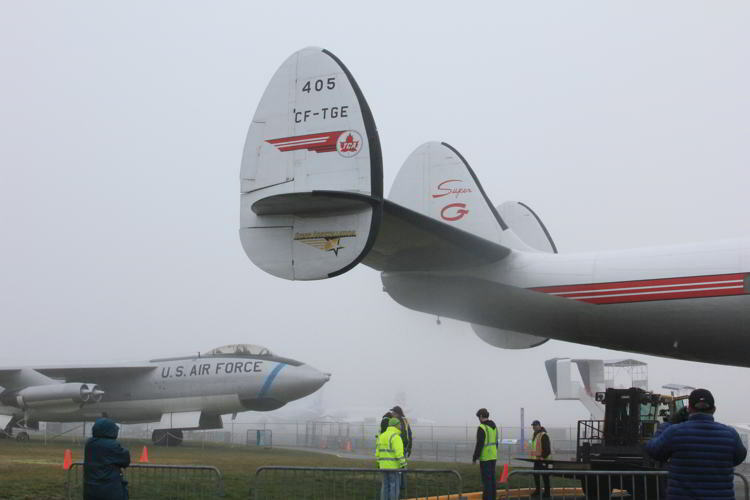 Three would wind up in a temporary area just north of the Museum, while the Connie went on the Berm in front of the MOF next to the B-47. 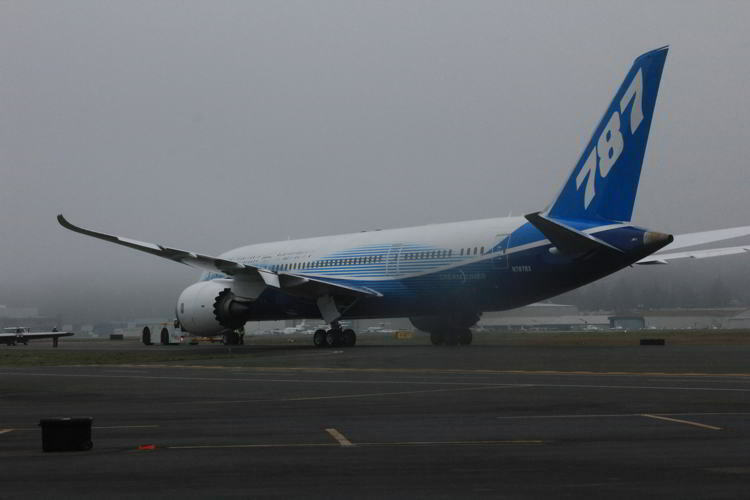 First up was the 787 - which was already on the east side of East Marginal Way. 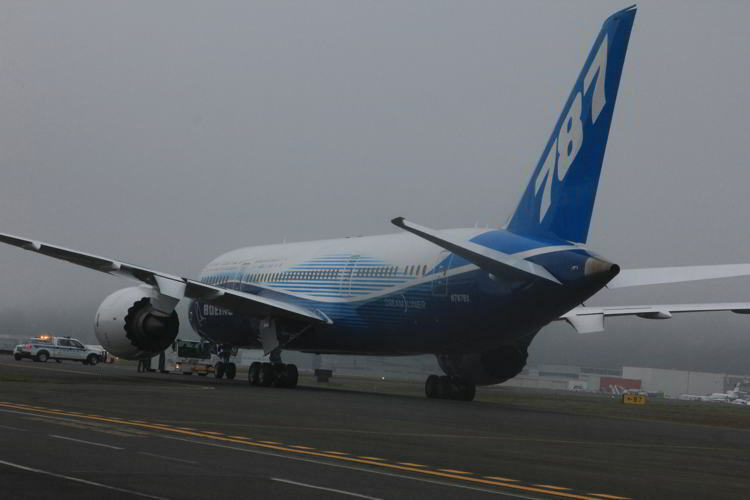 It moved down the ramp and then north on the Bravo taxiway to make room for the moves. 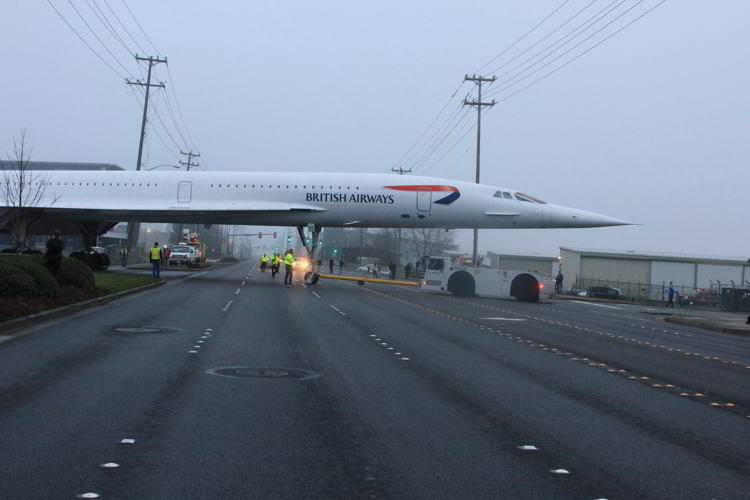 Then, Concorde moved out of the Air Park and across the highway. 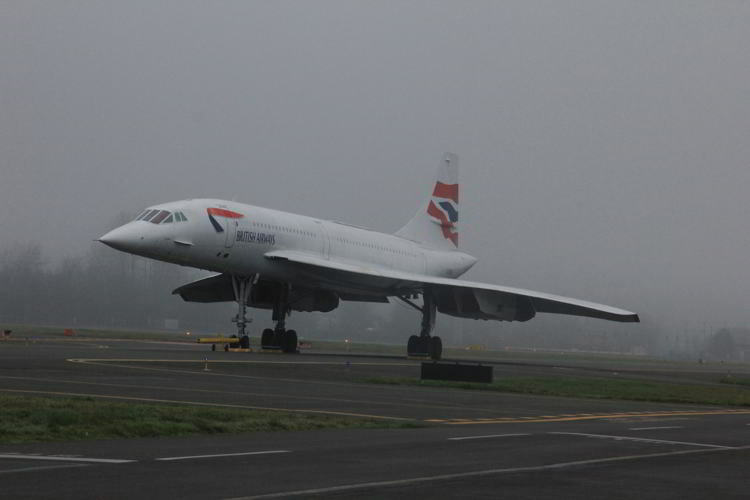 You can see here just how sleek this airplane is. Awesome! 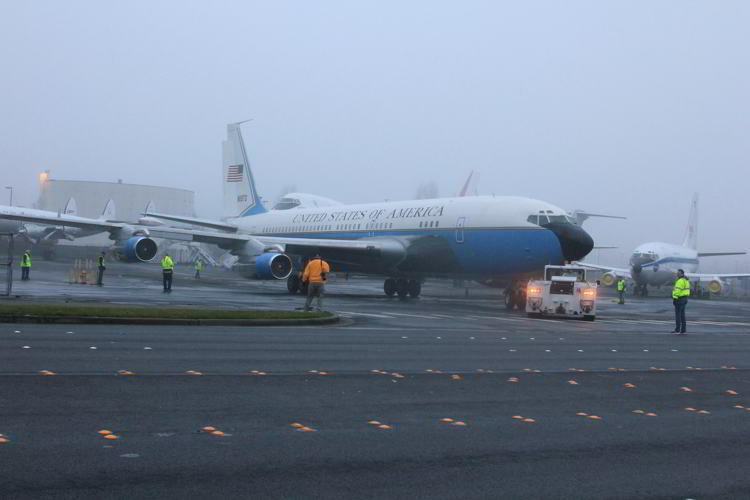 Next up was the 707 - Air Force One. 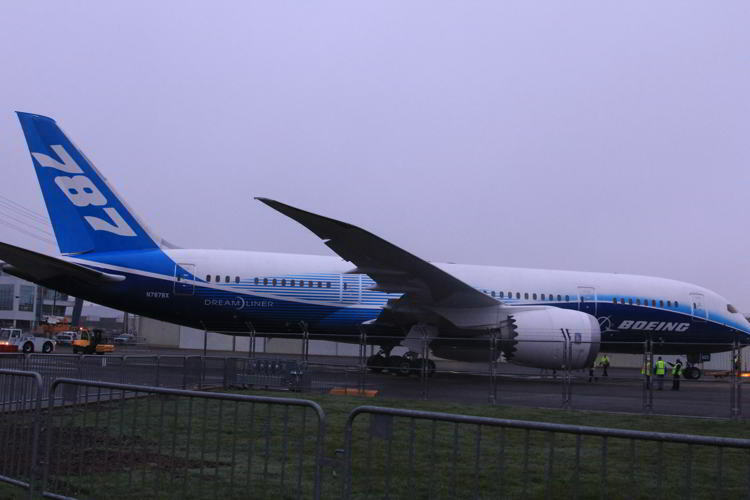 Will that fin snag those wires? 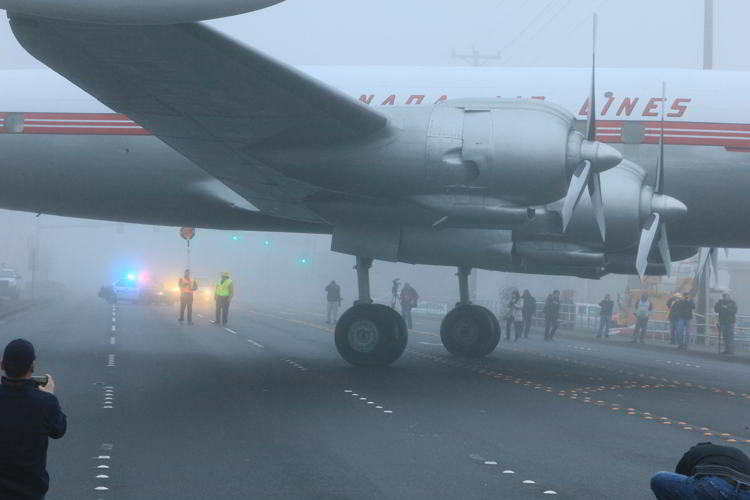 It crossed the road and trundled down the airfield ramp into the fog. 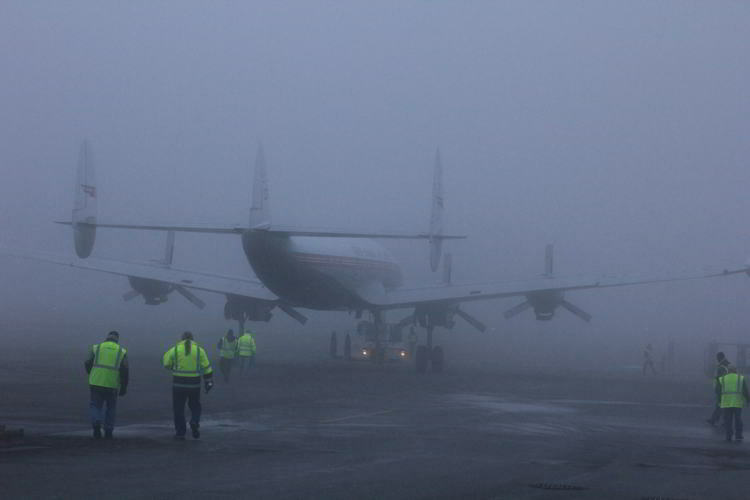 Man, that is thick stuff out there! 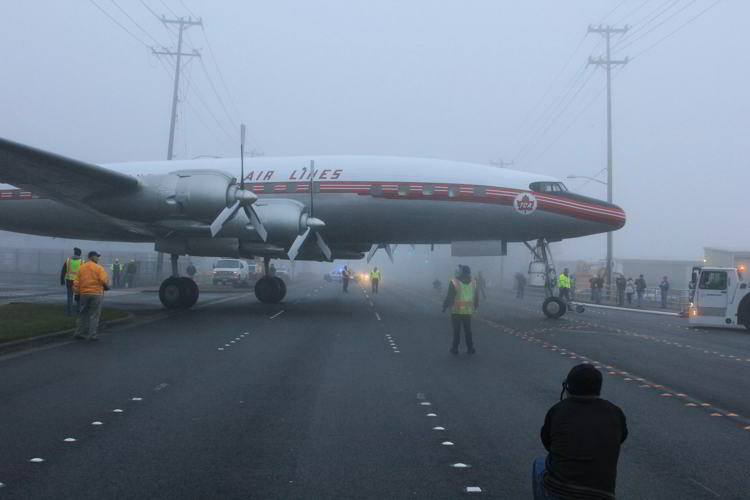 Finally the Connie takes her turn, heading out, across the road, into the pea soup. 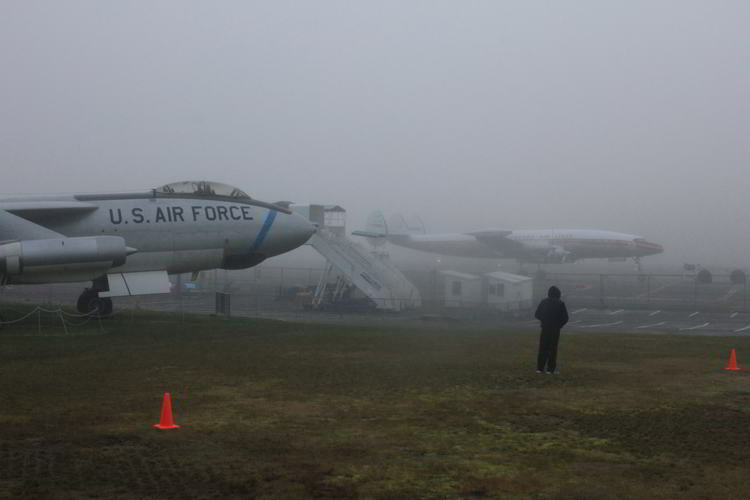 The remaining airplanes in the Air Park look a little forelorn in the mist. 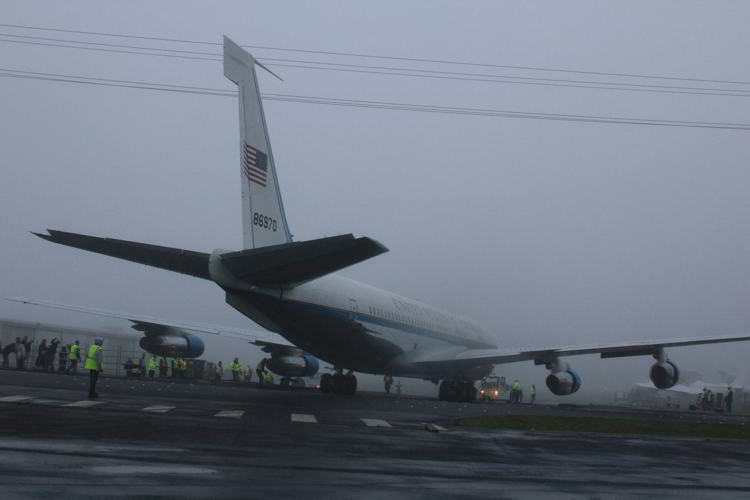 Is that you, Air Force One??? Holy Moly. That stuff is THICK! 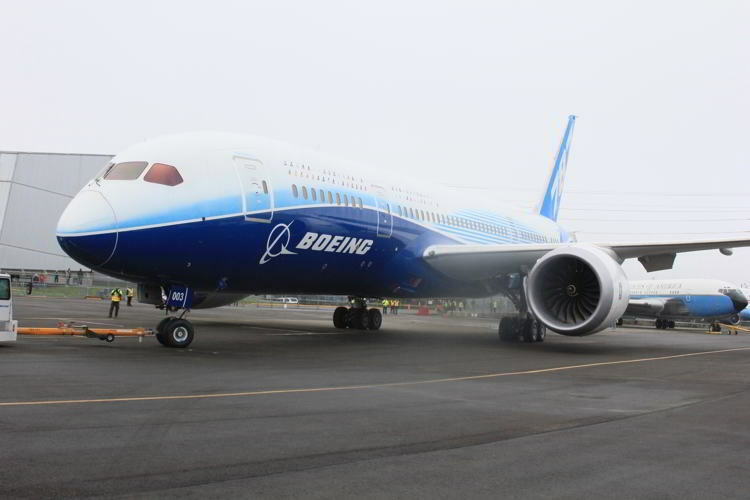 Here's why this was such a great airplane lovers day. 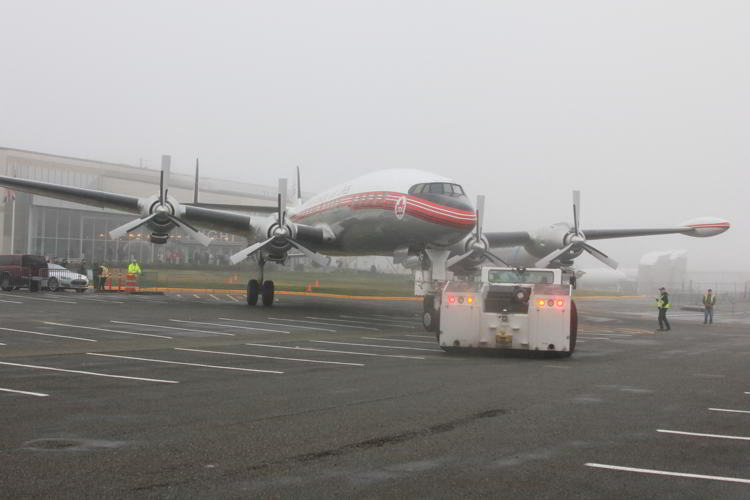 Not too many chances to see these beautiful machines out on the ramp without being bunched up closely with a lot of stairs and equipment surrounding them. 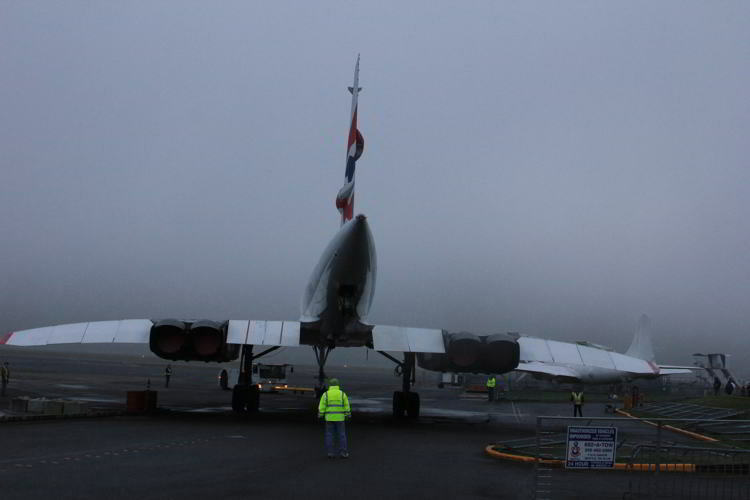 A great photo op - even with the fog. I can "fix" these pictures later. 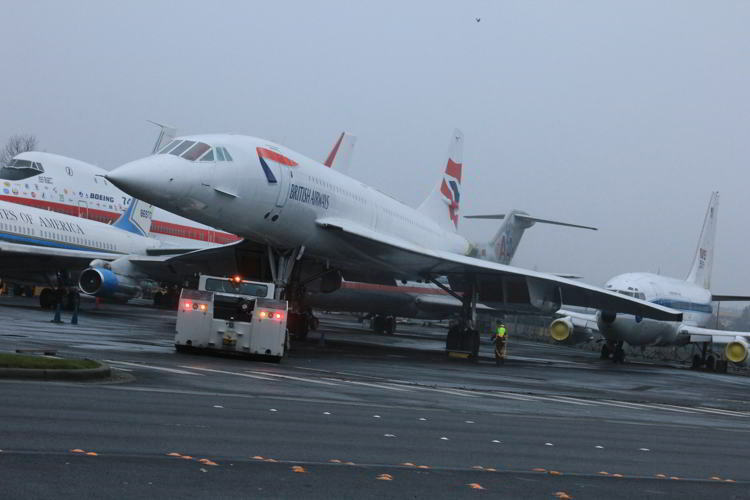 Oh Concorde! You are soooo beautiful!!! Now it's time to move them into their new spots. 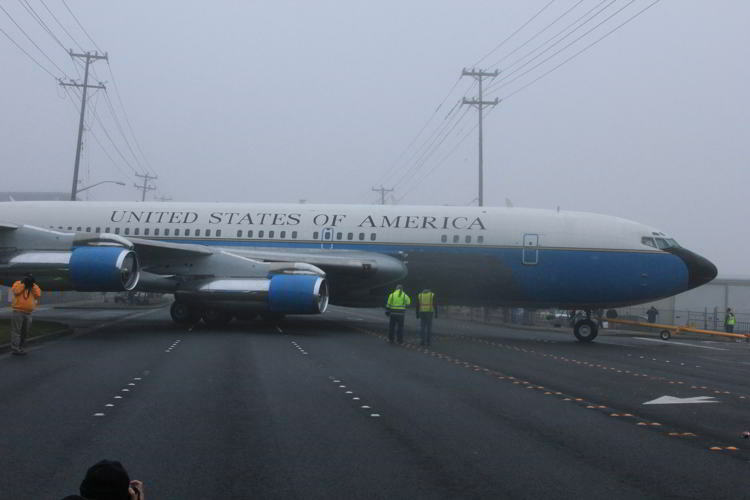 In their new parking area, first is Air Force One. 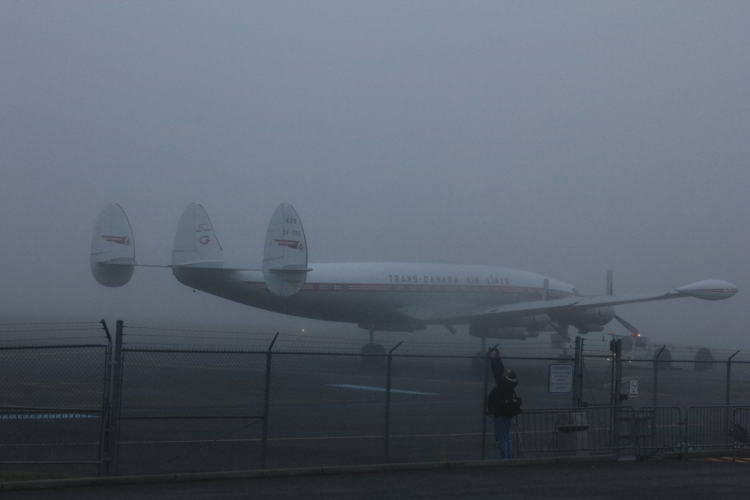 And last, but not least, The Super G Constellation. "Hello B-47, I'm your new room mate, what's your name?" 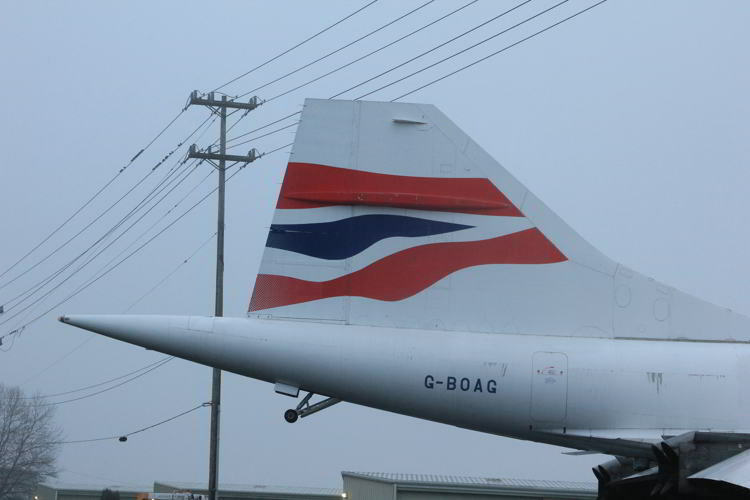 "Stratojet" "Nice! You can call me Connie." 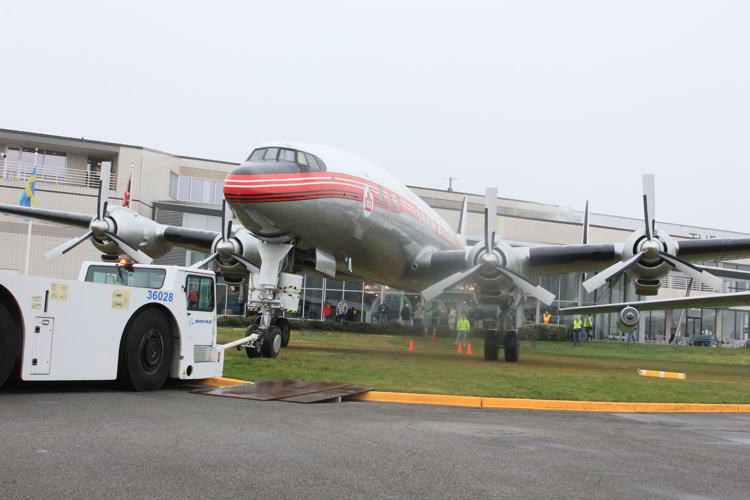 When the Connie first arrived, I tried to convince Museum management to put her on the Berm in front of the Museum entrance. Didn't happen. But, sometimes good things happen to those who wait. 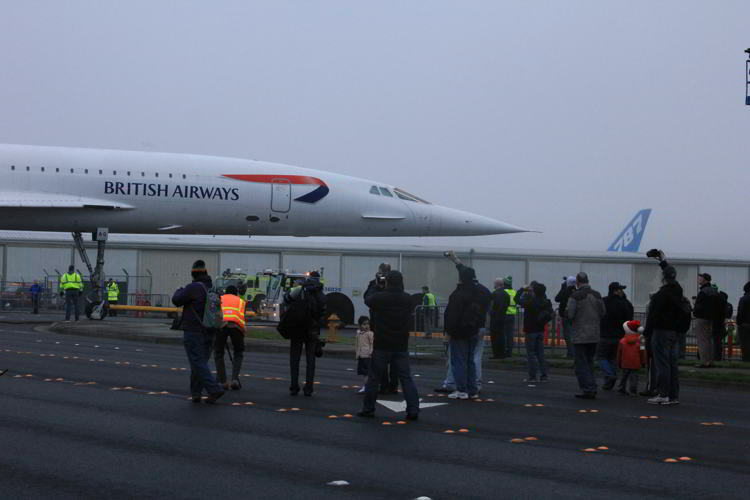 Now on the Berm, she will greet Museum visitors as they walk up the ramp to the entrance. And she looks great! 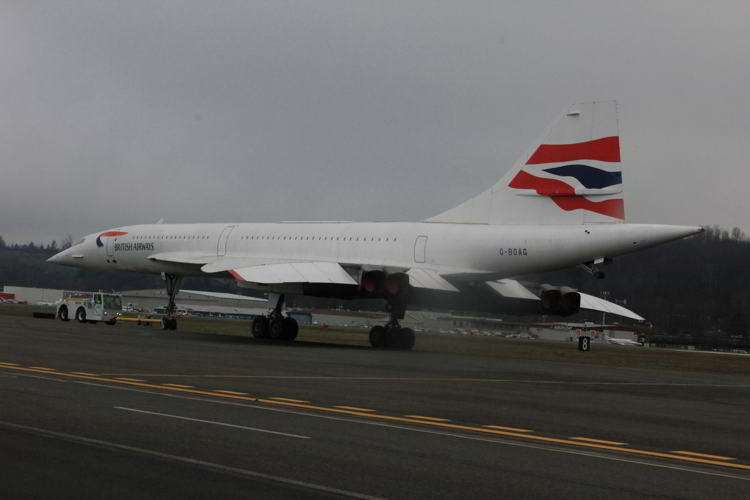 A very noble and graceful greeter, strutting her stuff, as only a Super G can. 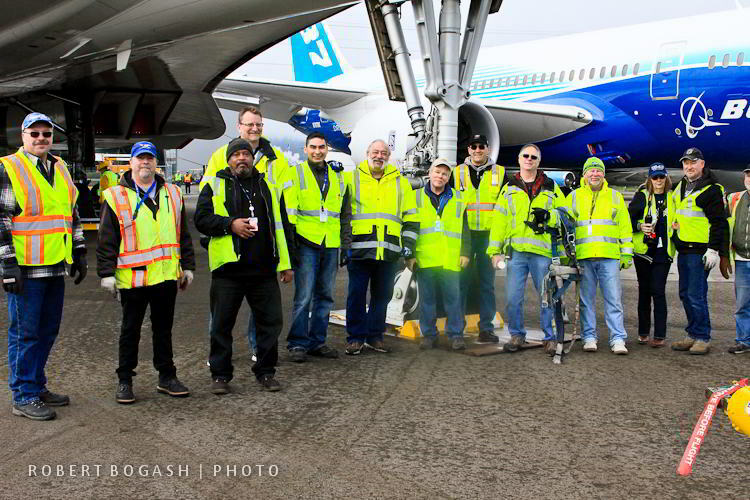 Some of the great move team - part Boeing / part Museum staff and volunteers. 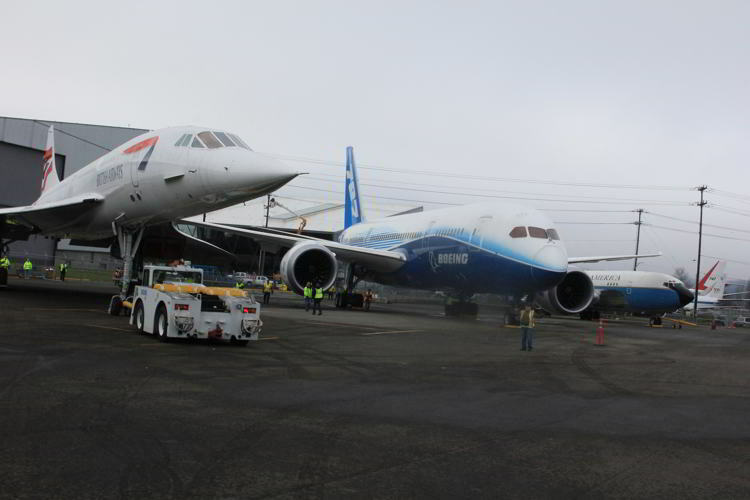 In two weeks, the 737 and 747 Prototypes will be moved behind the Raisbeck Aviation High School. 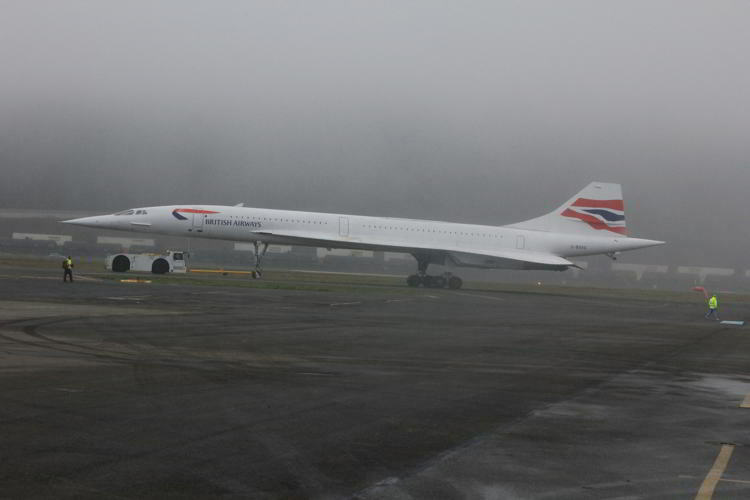 The American 727-200 will be scrapped. 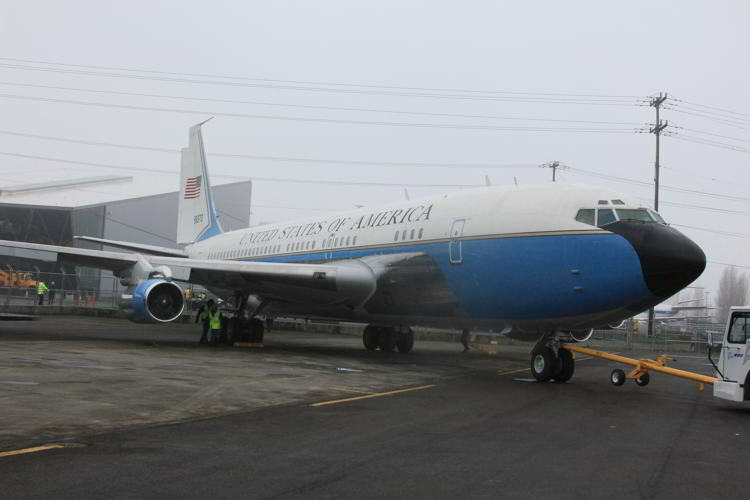 The Museum already has the 727 Prototype airplane - it's located at Paine Field in Everett. 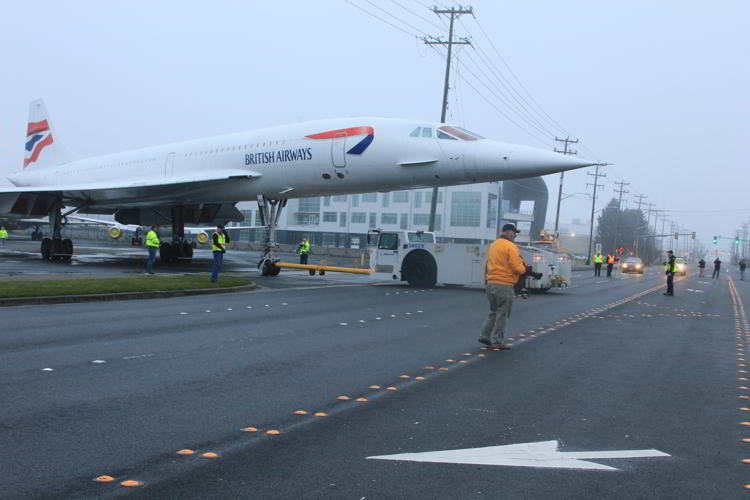 Hopefully, it will be flown down on its final flight to join the other Prototypes in the new building.